Imagine spending two and a half weeks in an idyllic mountain setting…. Welcome to the Penland Experience! Penland School of Crafts is a thriving campus that offers residential studio programs for artists of all stripes. It’s like a summer camp for glassblowers, printmakers, woodworkers, bookmakers, metalsmiths, photographers, sculptors, painters… and fiber artists, like me! At the end of July, I had the opportunity to spend two and a half weeks in this creative paradise, learning to look at my art and my environment with fresh eyes. 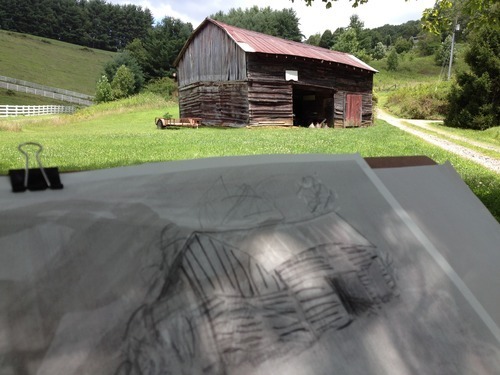 With the support of a Penland scholarship, I signed up, packed my bags, and drove up to Western North Carolina to immerse myself in a drawing class, knowing that drawing is the basis of all art forms. 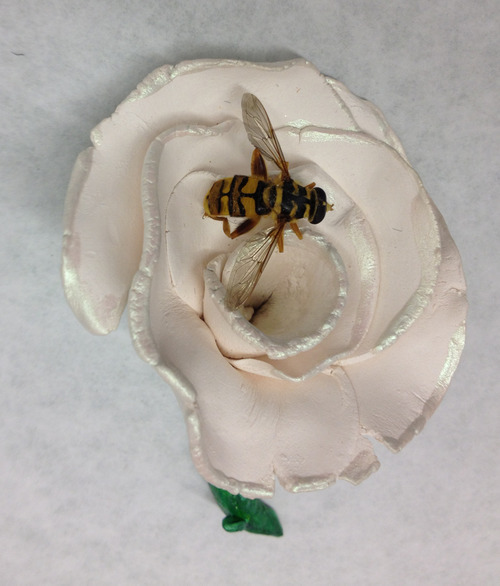 I kept a journal and took lots of photos - here is a selection, below, to give you a taste of what I found at Penland. 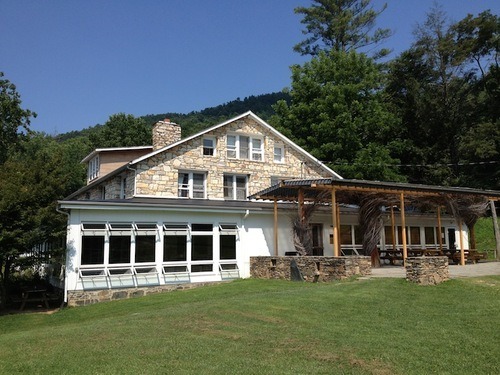 Penland was founded by Lucy Morgan in the 1920’s seeking to support both the crafts and the community, and it has grown into a secluded 400 acre campus. The School, which is six miles from the nearest town in the Blue Ridge Mountains of North Carolina, hosts approximately 1200 students each year in an impressive (and carefully orchestrated!) array of workshops, programs, and residencies. Lucy sought to honor “the joy of creative occupation and a certain togetherness—working with one another in creating the good and the beautiful.” Today, that mission is carried on by the thousands of artists who contribute to Penland’s supportive and inspiring community. 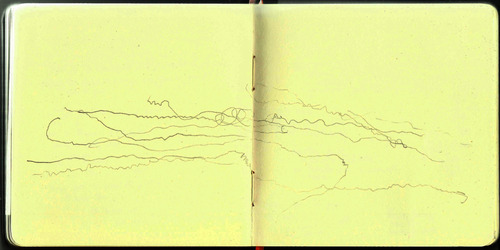 I arrived at Penland a day before my course, Drawing: Points of Departure, officially starts. I was elated as I drove up the mountain, excited to be in a new environment to learn new skills to apply to my artwork. Committing over two weeks of time - away from my home, away from my studio, in a place I’ve never been to - is a little scary. But I was ready to challenge myself, and my art, to something new and different. Penland has a great reputation as an inspiring and welcoming community. 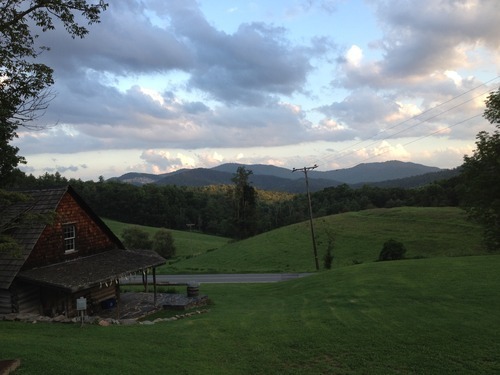 I’m amazed by my first glimpses of the campus - it’s beautiful, tucked away in the rolling Blue Ridge mountains, and scattered with rustic buildings, grassy fields, walking paths, and spacious well-stocked studios. Busy day today! Everyone is settled in and eager to get started on our artwork. We had a campus-wide orientation session tonight, then met with our instructors for the first time. At orientation, we learned that in this session alone there are 165 students from 7 countries and 33 states! 45% of the students are here on some kind of scholarship, like me. I was amazed to hear that they make such an effort to ensure that so many can participate. I know it made a big difference in my decision to come here - and I can already tell that my work-study job is going to be a great way to get to know people in the other courses. I’m on the kitchen crew, where I help clean during lunch and dinner shifts. I feed dishes into my pal “Rex,” the automatic dishwasher - I love the rhythm and the cleaning, both of which are very satisfying to me! 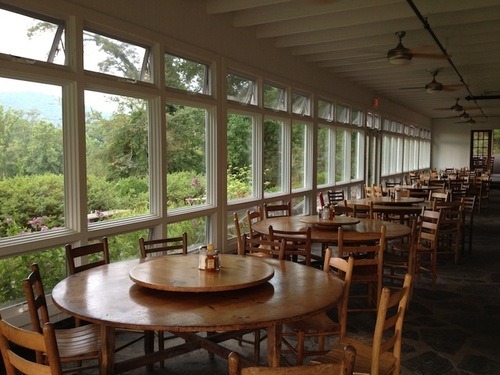 An interior view of the dining hall. I love those windows! I spent a lot of time here at “The Pines” - it is a dorm, a dining room, a coffee shop, and a gathering place! My drawing instructor is Susan Goethel Campbell, an artist from Michigan who’s very interested in how our environments affect our perception of the world around us. She’s here to help us expand our understanding of drawing, to use it both as a way to express ourselves and to explore the natural world. There are all kinds of artists in the class, from places near and far, but most of them are here for the same reasons I am. We all seem to be interested in returning to the foundations of artistic skill to brush up, gain confidence, try new things, and see how this experience affects our work. I think we’ll get along well. There are 10 of us, all women, and ages range from 20s to 60s with experience levels ranging from student to professional. Susan told us more about a book that the Director of Penland, Jean McLaughlin, had just recommended at orientation! Twyla Tharp’s “The Creative Habit” is something I will definitely have to check out. Tharp’s message is that art is a creative habit that must be developed, and that in the process you will come to “honor the lens you view the world through.” Susan incorporated this idea into the course by making one component of our assignment a daily drawing project. We each chose a focus related to a “mapping” theme and drew explorations of that idea in our sketchbook every day. “The more you establish a creative habit in the studio, the more you will be open to new ideas and the less you will question or second guess your work,” she told us. Susan also encouraged us to develop individual work that aligns with our personal visions and interests, reminding us that we should love what we are doing while drawing. We also talked about developing realistic goals for the experience - she said we’ll be shocked by how quickly the two weeks will go by! After class, I walked back to my room. After the first night in a room for 18 other women, I’m glad to be in my permanent housing now. It’s still a shared room, but with a much more manageable number of roommates: three. Plus, the dorm is nestled in the woods - just like home. Yesterday I had a chance to take a quick bike ride around campus, and I’m looking forward to exploring more of the area by bike soon - it’s such a great way to experience a place. The cool mountain air is amazing, too. It’s a welcome break from the humidity and heat of this tough summer back in Athens. The view of the mountains was beautiful this morning; low clouds nestled in the valley facing the campus. I began the day with yoga. Penland offers a movement class each session for the students in the studio courses, and it’s fabulous because the teacher really helps us work out the kinks that our muscles develop from working on our crafts. The yoga helps us breathe, open, and relax our muscles and our mind. I found that if I was behind on sleep, I would walk out of the the yoga class more refreshed than if I had taken a nap! In class today we talked more about the idea of mapping. I started a new phase of the long term assignment - mapping people’s movements around campus! I am very interested in movement through time and space, but this is a new way of exploring that idea. I usually focus on more static subjects, like architecture, as a way to represent time and movement. I think that my years working with landscape architecture has influenced me; I am now much more attuned to how people use space. It was fascinating to hear what other people chose to focus on for their mapping project. Topics included insects, clouds, and mushrooms! At the end of the course, we’ll combine all of our research and find a way to make something that reflects all of our observations and efforts during our time here. Today’s drawing assignment was to draw the twilight - an interesting concept, and I had fun with it. 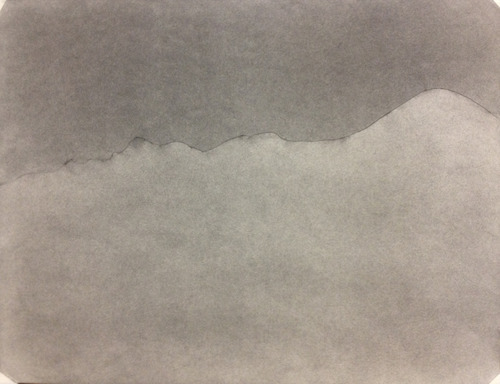 I chose to draw a nearby mountain in the twilight with the dark sky behind it. I incorporated skills that we’ve been discussing, like using grated charcoal rubbed down into the paper to create a ground, and focusing on shaping tone and line with light and dark areas. After class, I stayed behind to work in the quietness of the empty studio. I added my finishing touches, and created a stencil to get the line of the mountain ridge just right. I also stopped by the Bringle Gallery open house this evening. 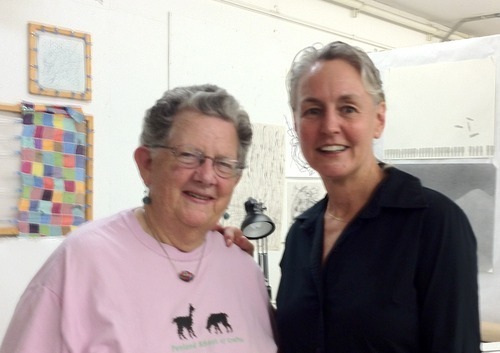 Cynthia and Edwina Bringle are twin sisters who are integral to the Penland life and community and have been for many years. 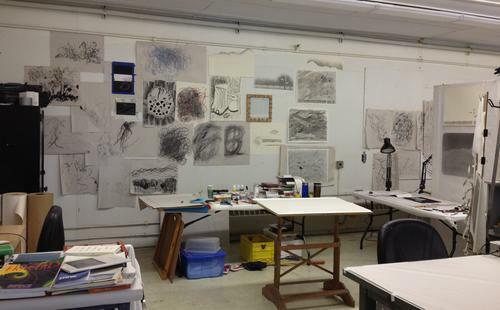 At the start of each session, they invite everyone on campus to see their home, their studio, and their work. It was one of the things I was told I must do while attending Penland! They are a perfect example of the openness and welcoming nature of just about everyone associated with this school. After a regular day of classes, yoga, and work yesterday, I was treated to another home visit today. Lisa, who is in our class, and her husband John invited us out to their farm. They’re both potters, and also printers - so there were tons of letterpress printing supplies upstairs, and tons of pottery supplies downstairs! Our assignment there was to draw what we saw - and we could interpret that in any way we wanted. Each person in the class found something different, and everyone drew their subjects in different ways. Some drew mushrooms (one fungus was climbing up a tree! ), black heirloom tomatoes, climbing vines. I used a sheet of paper that I had created on the previous day - it had lots of grey tones, lines, and shapes on it - and drew a barn on it. Drawing an object on a busy background is very unlike me, but it was a fun experiment and I was very pleased with the finished picture. See, I’m expanding my comfort zone already! It was a warm day today, beautiful and sunny, and the clouds were fabulous to watch as they scurried across the sky. You frequently hear Penland called “a safe environment,” and I’m beginning to understand how true that is on a variety of different levels. Not only do I feel physically safe (despite the warnings to watch out for bears! ), it’s also a safe environment because of the sense of community, and being with like-minded people, and knowing that you can try new things, stretch your personal boundaries, grow as an artist, yet be crazy in some ways! Jenna, a friend of mine from the kitchen crew, joined my class for a while today. She’s here for the printmaking course, but is looking for a way to loosen up after carving wood blocks for printing. Susan is so approachable - she has a wonderful grounded air about her that attracts others to her, and Jenna was welcomed. 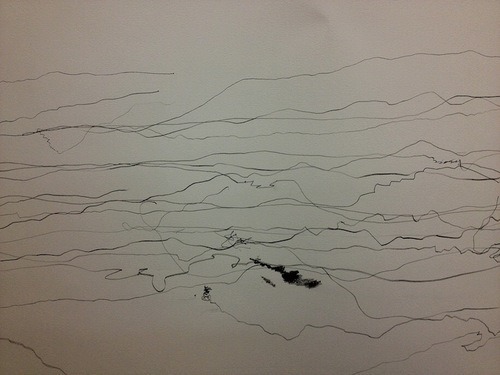 We were doing another daily drawing exercise, where we play recorded nature sounds and respond to them on paper. Sometimes we even draw with our eyes closed! It is very freeing, relaxing and creative. Immersing myself in all this creativity is great, but one does need to come down off the mountain once in a while! Last night I joined new friends at dinner in the nearby town of Spruce Pine. We went to a delicious local foods restaurant, the Knife and Fork, and had a great time relaxing, chatting, and sharing our meal. I even ran into some Athens folks who were visiting the area! And this afternoon my classmate Kay took Serey, a classmate from Atlanta, and I along as she went to her friend’s house to check on her pets. It was an incredible house - the owner built the house all by herself, and she literally covered every interior surface with some sort of art. It’s located right on the river, and before we left we walked through the deep yard filled with her sculptures and whirly-gigs to the riverbank. I was able to take off my shoes and put my feet in the river, and then I just couldn’t resist - I had to put me in the river too! I began working today on a 6 foot long piece of beautiful drawing paper to expand on the idea of mapping people’s movements around campus. I set up my huge easel on a second story porch, and watched people in the distance move through their day. It is wonderful to be able to pick up the personality of a person - even if I don’t know them - by the way their movements affect the line that I draw. I use a different pencil for each person, and note the day and time that I am mapping their path. I’m not drawing people, I’m drawng movement… it’s a very exciting concept to me, and it’s so satisfying to see it start to take form on my paper. No kitchen work today! Good thing, because my class took a long field trip. First we went to the Sudduth’s house and studio. 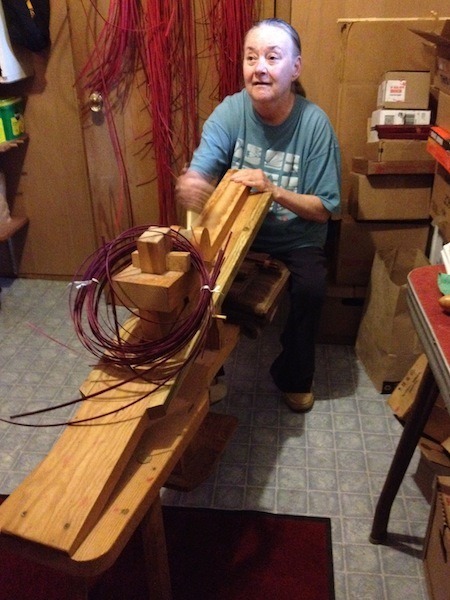 Billie Ruth Sudduth is a master basket maker - she was named a North Carolina Living Treasure in 1997, and she supplies the White House with stars for the Christmas tree, and her work is in the Smithsonian and the Museum of Art and Design, New York! It was so wonderful talking to her, and she was so kind, considerate, and humble. She sells her exquisite baskets online through ETSY, for Pete’s sake! Her husband Doug is a photographer, and is known for (among other things, of course) his photographs of lenticular clouds. This was a new term to me - it’s a certain type of very striking cloud formation that happens only on the lee side of rugged mountains, in cool weather…and looks just like UFOs! Billie Ruth showed us her baskets, her studio, and how she dyes the reeds in the back yard with black walnut dye. She weaves baskets according to the Fibonacci sequence, numbers that indicate a mathematical proportion that has been used in design, architecture, and music for centuries; it is the basis for the Golden Mean. She told us about how she stumbled on that design, and only later learned that there was a specific name for it. Now, all kinds of museums seek her out for this incredible talent in a vanishing skill. It was so inspiring to hear her stories! 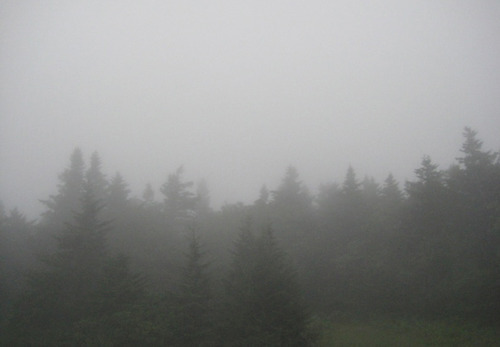 Next we drove over to Roan Mountain to learn more about Cloud Immersion. Between Susan’s fascination with clouds and Doug’s photos, we were very curious to learn more from the scientists we scheduled an appointment with. It was raining on our way there, and even though it was late July we were cool, and the mountain roads were glistening and beautiful. The scientists were near the site of the old Cloudland Hotel, collecting data on the ways that clouds affected the mountain, and vice versa. We learned a lot about the geography, and weather patterns, and ecology, which was very interesting, and we stood there in the mist and looked at their sensing and data-gathering equipment and marveled at their methods of inquiry. It was so very beautiful up there. 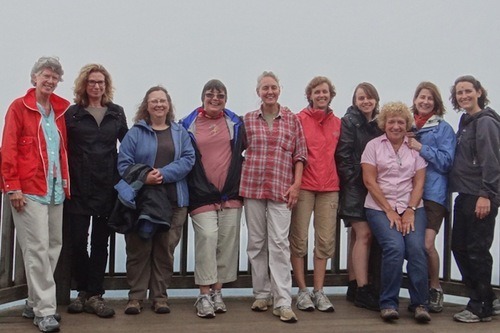 Before we left we walked to the overlook and marveled at the view - forest, mountains, and fantastic cloud formations! Class Photo at Roan Mountain! The Penland resident artists hosted an open house tonight, so I went by after my dinner shift. These artists come to work at Penland for three years and have no other responsibilities except to make art! I’m amazed that Penland can provide these types of opportunities. I visited the studios of the glass artist, weaver, woodworker, fiber surface designer, and ceramists. Their work was amazing, and it was so fun to be able to talk to them and hear more about how they made the decision to spend three years living on top of a mountain creating art. In class, Susan and I have been talking a lot about describing space using line and tone. I am still formulating my thoughts on that one. I had packed up some of my early practice drawings, but she helped me pin them back up, reminding me that we should display the progression of our work throughout our time here. 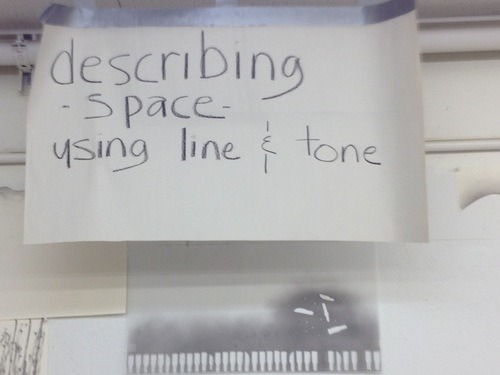 After our conversation, I hung a sign from the ceiling that states “Describing Space Using Line and Tone” so I can continue considering what this means to me. The sign reminding me of my focus here! 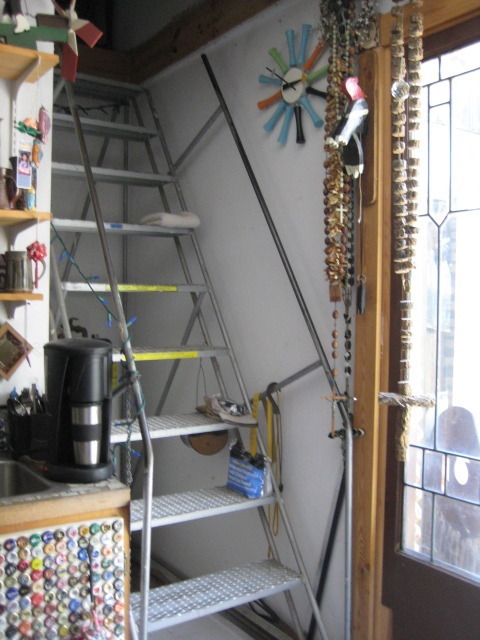 This morning I went to the studio early to start organizing my space in preparation for our drawing studio open house. Once class started, we had a meeting to plan for the event, and everyone got so into it that we decided to have a pre-party party! We ordered pizza and beer and wine, and the festive mood kept us motivated to continue preparing our work space for our visitors. The studio looked very professional, and we all had work displayed that was representative of our path of exploration and growth during this class. Susan recommended that we leave out our current work in progress, too, so that visitors could see our creative process. The party was a HUGE success! The Drawing Studio Open House and Bug Wake showcased our drawings, yes, but also a huge collection of bug coffins created by people from all the current Penland classes. 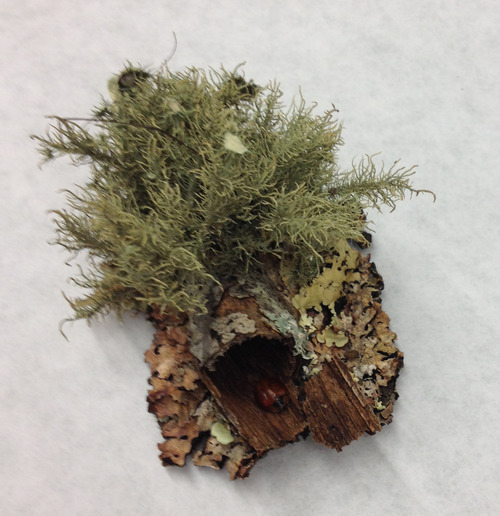 As my classmates studying bugs for their mapping project amassed a collection, a student from another class suggested we create coffins for these insects. The display was a big hit! Everyone marveled at the beauty, intricacy, and variety of the coffins, and at the way one person’s idea grew and spread across campus to include so many contributions. The coffins were photographed at the end of the night, and will be included in the end-of-session auction, which supports financial aid at Penland. During the reception, I (and the other participants in the drawing course) spent most of the time standing by my artwork to chat with visitors about my drawings and to discuss my methods and purposes. I love doing that! And I met so many new people - too bad we couldn’t have done this at the beginning of our time here! I’ve moved all my things out of the drawing studio now, and the place looks so bare without any sign of our time together here. Earlier in the day, we had our final evaluations/critique… Each student had 10-15 minutes to give an overview of their work and their impressions of the class, with time for responses from classmates and the teacher. Each artist in the class has a very clear artistic vision, and it was fascinating to hear how our ideas overlapped and how we influenced and inspired each other. I sound-recorded the whole session on my phone (which was especially good because I had to duck out early for my last dining hall shift!) so that I can continue to refer back to it when I’m home. 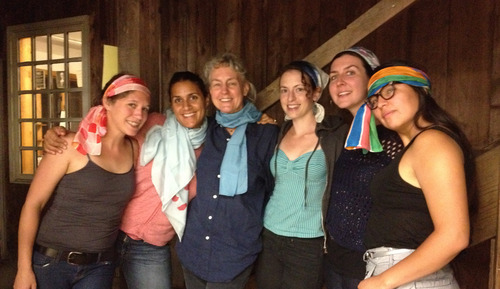 My kitchen pals: Jill, Nicole, Rene, Rose, Jenna and Marcella. Tomorrow we’ll have the campus-wide Show and Tell, where each class shares its work. My class is planning to hang our mapping projects, so my big 6 foot drawing will be the work that represents my contribution. The response from everyone who has seen it so far - other students, Penland staff - has been very encouraging. They love the size and the idea, and have lots of thoughts to share and questions to ask, and end up getting just as excited about it as I am! Hmm, maybe I am onto something I can continue in Downtown Athens….! Overall, I feel very good about my oeuvre, and very strong and confident. I’ve had great reactions to my drawings, and it has been really interesting to me to hear which pieces speak to people. Different people are drawn to different works, for different reasons, and sometimes even works that I am not particularly proud of are quite meaningful to others. It’s such a gift to be around people who think about art every day, and are willing to share their experience and opinions and ideas without fear or doubt. I can already tell that this experience will continue to inspire me for YEARS! The drawing studio met at 10am to prepare for Show and Tell, and at 11 we walked up the hill to the exhibition building which was also the wood shop (where I finally got to see the boat the wood class had just built!). I displayed my big drawing and the small circulation pattern drawing. After that, I went to Spruce Pine where I window-shopped, ate lunch, had a coffee, and gathered my wits. What a fantastic experience Penland has been, but it is non-stop activity! After filling the tank with gas in preparation for the drive home, I returned to Penland, sat in front of the textile building to watch the light change on the mountain as the evening descended, and reflected on my experiences here and what will come next. As we said goodbye, Susan was very complementary of my artwork and my work ethic. I certainly will strive to work with her again in the future - this class has been highly productive for me; transformative, I could say. She mentioned my openness to change. I told her in parting, that I had come to Penland looking for confidence, and that she has helped me find it. Oh oh oh - doors are opening up!!!!!!!!!!! What a great class experience and a great learning experience this has been. I have made many new friends and walk away with new contacts. Now it is time to go back to work in my own studio. What direction will my artwork take now, I wonder? I can’t wait to start, and I hope to share it with you soon! 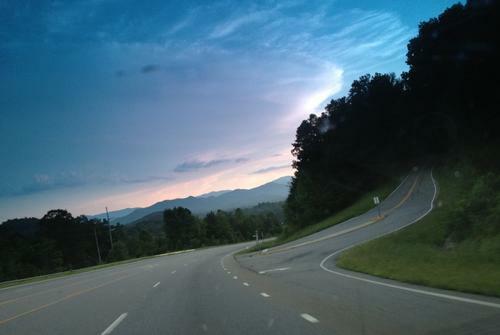 Driving down the mountain, on the road to home!